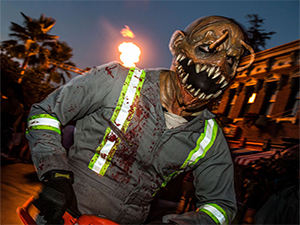 Face your darkest fears in Southern California’s scariest, most intense event - Universal Studios™ Halloween Horror Nights™. 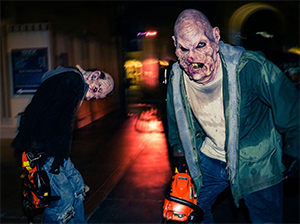 The movie studio that invented the horror genre brings to life all-new immersive worlds of living, breathing icons from the most twisted imaginations in film and television. Select Nights Sept. 14 thru Nov. 3. This year, discover the dark secrets lurking in the Upside Down world of Netflix’s Stranger Things. Plus, brace yourself for 7 more spine-chilling mazes designed to bring you nightmares so real you’ll wish you were already dead. © Netflix TM & © 2018 Universal Studios. All Rights Reserved. 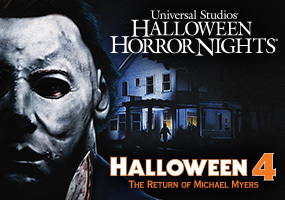 You'll be directed to a special secure Universal Studios Hollywood web site exclusively for Fun Express customers. Upon checkout, you may select the 2nd option which says "I do not want to create an account..."
All tickets are InstaPrint eTickets emailed to you upon purchase. NO REFUNDS OR EXCHANGES. Dates and prices subject to change.